This is an extraordinary example of Guillaume Delisle's 1722 important and influential map of Africa. It depicts the African continent in stunning detail with numerous notations and comments regarding the people, geography, and wildlife of the region. The present map, aided by a wealth of new cartographic data then flowing into Europe, particular Paris, is among the first to scientifically assess and reconsider the region. Delisle, a very cautious and scientific cartographer, based most of his cartographic advances on first hand reports from diplomats, slave and ivory traders, missionaries, explorers as well as speculative hearsay picked up by these same groups from the African indigini. Delisle has here refined most borders, removed double place names (a common error in earlier maps), reengineered various mountain ranges, and deleted questionable data. This map offers significant detail throughout the interior naming numerous tribal areas and kingdoms including the Jaga, the Angola, the Kingdom of Nimeamaie or Mono-Emugi, Monomotapa, Gaoga, Gingiro, and others. The Kingdom of Gingiro is known from the reports of the Jesuit Anton-Fernandez who traveled to the region in 1613 on a mission for King Philip II of Spain. Anton-Fernandez offer a wealth of detail about the Kingdom nothing that Gingiro means 'monkey' in the local language and that the king himself a kind of monkey-God. One hundred years later, when Delisle drew this map, Anton-Fernandez's journal remained one of the few reports of this region available and, for want more up to date information, was incorporated. Most other regions of Africa rely on equal vagarious references. The upper quadrants of this map are dedicated to a rather interesting depiction of northeastern Africa from the Mediterranean shores to the Horn. Abyssinia (modern day Ethiopia) was mapped in detail by early Italian missionaries and of considerable interest to Europeans first, because it was (and is) predominantly Christian; second, because it was a powerful, well-organized and unified kingdom; and third because the sources of the Blue Nile were to be found here. Delisle correctly asses the course of the Blue Nile placing its source at Lake Tana, (here Dambea) in modern day Ethiopia. The Ruins of Axum are identified just to the north of Gondar. In the southern half of Africa there is relatively less information on the interior save for those lands mapped by the Portuguese along the Congo and Zambezi Rivers. Here, two large empires are named, Monoemugi and Monomotapa. This is the great southern African gold mining region and these names are likely taken from the names of prominent Congolese tribal rulers. Monomotapa is particularly interesting as many considered this area to be the Biblical land of Ophir, where one could discover the mines of King Solomon. Just north of Monomotapa, Lake Malawi, here identified as Maravi, appears in a long thin embryonic state that, though it had not yet been 'discovered,' is remarkably accurate to form. Lake Malawi was not officially discovered until Portuguese trader Candido Jose da Costa Cardoso stumbled upon it in 1849 - one hundred years following Delisle's presentation of the lake here. Delisle's inclusion of Lake Malawi is most likely a prescient interpretation of indigenous reports brought to Europe by 17th century Portuguese traders. Its form would be followed by subsequent cartographers well into the mid-19th century when the explorations of John Hanning Speke, David Livingstone, Richard Francis Burton and others would at last yield a detailed study of Africa's interior. In South Africa the Dutch Company is strongly established and the region is well mapped well into the interior. Shows the Portuguese trading colonies of Sena and Tete (Santiago) on the Zambezi River. This map also includes the Azores, the Canary Islands, and the Cape Verde Islands. 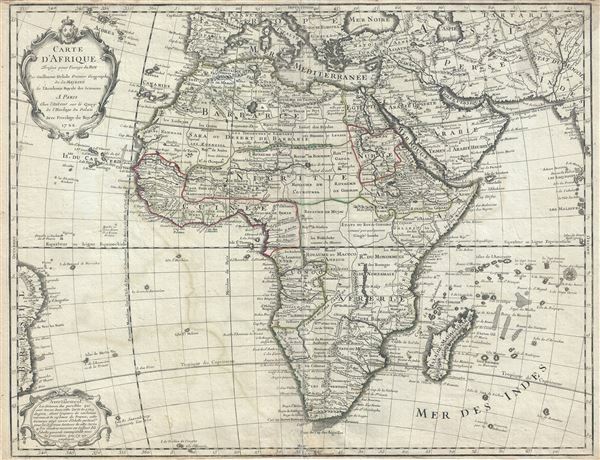 Delsile created this map in 1722 to update his earlier maps of Africa. As a whole it is a complete reimaging of the continent with numerous updates and revisions throughout. Its accuracy and influence made this the basis for most subsequent maps of the continent. The map is rendered in Delisle's distinctive and innovative style which eschewed the flamboyant Dutch strapwork of the previous century in favor the highly detailed, information rich, and decorative cartographic approach seen here. Very good. Minor wear and verso reinforcement along original centerfold. Lower margin extended. Original platemark visible.